Founded in 1931 by Drury W. Ghegan, Bonded Service was one of Atlanta’s first logistics companies. The company was founded on the simple concept of providing great service through great employees. Bonded Service Warehouse Inc. has remained a family owned and operated business under current President and owner Thomas H. Ghegan. 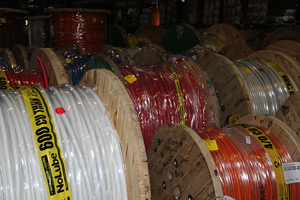 Over the past 80 years, many things have changed throughout the company such as implementing new industry technologies including RFID tagging, barcode scanning, and real-time inventory management, but the understanding that we must give our customers the best service has not changed since the day the company’s doors first opened. Today, Bonded Service operates over 1 million sq ft all over the greater Atlanta area and two brand new facilities in the Savannah area designed to meet demands of our clients needing close proximity to the Port of Savannah. Our state-of-the-art facilities offer our clients the latest in distribution and fulfillment technologies. From leading American and international manufacturers, regional leaders, and emerging enterprises just beginning to understand their logistical challenges, our client base reaches all elements of everyday life. Our 80+ years in operation have given us the experience to handle all types of products. Give us a call and we can chat about your products and concerns.